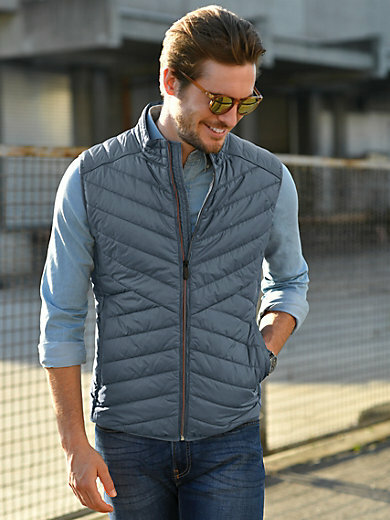 Quilted gilet by CALAMAR with small stand-up collar, front zip fastening, and 2 zip pockets. One inside pocket. In water-repellent, breathable microfibre with lightweight padding for year-round use! Ideal for travelling – these breathable, lightweight garments take up very little space and are crease-resistant. Outer material, colour-contrasting lining and padding in 100% polyester. Length approx. 28ins. The quilted jacket is machine washable.